This homemade dog treats recipe is a terrific way to treat your furry friend to savory turkey and pumpkin flavors while you enjoy Thanksgiving. Stick these cookies into a toy to occupy your pup even longer! What Makes these Homemade Dog Treats Healthy? Humans need to eat a nutritious, anti-inflammatory diet full of fresh, clean, unprocessed foods to stay healthy, as do pets. 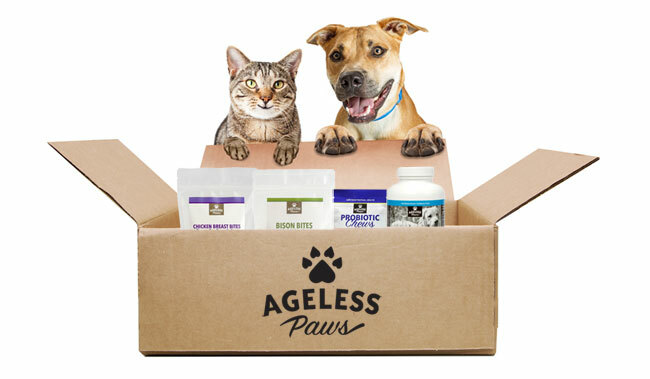 I am a firm believer that our beloved dogs and cats deserve clean, unprocessed foods and treats that are as close to Nature as possible, which is why Ageless Paws treats are freeze dried and made with just one ingredient each: turkey heart, chicken breast, bison liver, or wild Atlantic salmon…No artificial preservatives, colors or flavors. Oats – High in fiber, oats support heart health, help maintain healthy blood sugar levels, and are a good source of B vitamins, which help with nerves and energy. Turkey – Turkey is a great source of protein and also contains B-vitamins, as well as minerals like iron, potassium and zinc. The organs are especially healthy, as they are more nutrient-dense than muscle. Hearts and livers are among the best food sources of coenzyme Q10, a powerful nutrient the body needs to make cellular energy. If feeding dogs turkey scraps, just avoid giving them really fatty pieces. Pumpkin: A good source of fiber, pumpkin is also rich in beta carotene, an antioxidant plant nutrient that helps boost the immune system and protect the body against free radical stress. To boot, it contains essential vitamins including C, E and the B vitamin group, and minerals such as magnesium, copper, phosphorus, zinc and iron. Coconut oil: Coconut is one of my super foods for people, and unsweetened coconut meat is also good for dogs. I like it because it contains lauric acid, which has been shown to support immune health and can help ease allergies, hot spots, and itchy skin. Coconut oil is also good, just be conservative, since too much can trigger diarrhea, weight gain, and pancreatitis. Eggs: Another good source of protein, eggs also provide an assortment of important vitamins and minerals, and about a quarter of the daily requirement of choline, a vitamin-like nutrient essential for the body’s production of cell membranes. These nutritious turkey-pumpkin dog treats are also healthy because of what’s not in them…the beauty of DIY is that you don’t get artificial flavors, colors or preservatives that dogs just don’t need. My one caveat is to not go overboard in feeding these to your dog, as oats – a carb – are the primary ingredient, and overfeeding can cause your dog to gain weight (which can lead to health problems). Set a limit of about 3 or 4 per day (depending on how big each dog cookie is). Preheat the oven to 350° and grease a baking sheet with coconut oil, or line it with parchment paper. Grind the oats in a blender until a flour forms (it does not have to be fine flour, the oats can maintain some texture). Chop one cup of Turkey Heart Slices into cubes. Combine the oat flour and cubed turkey hearts in a large mixing bowl, and stir until well blended. Next add the can of pumpkin, egg and melted oil. Stir with a large spoon until all ingredients are mixed well – texture will be doughy, slightly sticky. Using a soup spoon or your hands, drop small balls onto the baking sheet and press down with a fork or spoon to make a disk. Alternately, you can roll out the dough and cut out shapes (bones! ), just grind up some extra oat flour and sprinkle as needed on the dough so that the rolling pin doesn’t stick to it. Bake for 45 to 50 minutes, possibly more depending on how thick the cookies are. Turkey-pumpkin dog treats recipe makes 24 2” cookies. Store in airtight container in fridge for up to 4 days, or in the freezer for 2-3 months.